Gurudev Sri.Veturi Prabhakara Sastri was born on 7-2-1888 Tuesday afternoon 12.20 p.m in Jyeshta fourth Quarter in the PeddaKallepalle Village of Krishna District of Andhra Pradesh. He suffered so many varieties of diseases. He took all varieties of medicines. He did not get any relief. Lastly he decided to commit suicide in Haridwar. At that time one day our Gurudev Sri Potharaju Narasimham garu (Medium number 123, who has joined with Bhriktha Rahita Taraka Raja Yoga on 30-1-1914) met Sastry garu accidentally at Madras (Chennai). He asked Sastry garu ”Why you have become like this” Sri.Sastry garu immediately told his difficulties. Sri.Narasimham said, “I have joined One Yoga. You can also join this Yoga. 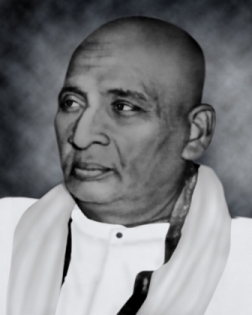 Certainly you are going to get relief.” Immediately he gave a recommendation letter addressed to the Master, Sri Sastry garu approached the Master at Kumbakonam with that letter and joined “Bhrukta Rahitha Taraka Rajayoga” on 22-6-1916 at 6.00 p.m. His medium number is 330. In those days test is taken by the Master. In the same manner test report of Sri. Sastry was also taken. “This soul is an ordinary type of the first sort and has passed 1731 births and is in the ladder of acquiring Gnana with Bhakti and though studied much in this birth and able to argue in bits in philosophy, he has no practical knowledge of any theories nor does he like to go in for any. He was a prey to his present disease for the last 3 years which has grown up very gradually, and he was seeking relief for his complaint at this stage being informed of the existence and curative power of this society; he was advised to seek help here which only can give him remedy and with this idea he was brought up here. From this idea the second thought extended that after being relieved from his ailments and seeing the result to request afterwards if there is any way for salvation. With this idea, he joined the society and if he finds any relief even minutely, he will work with faith and will follow instructions. He must be advised to continue practice for one month as per Masters personal instructions and after seeing the result to get advice either to continue practice or to undergo treatment”. Our Gurudev Sri.S.Sundaram is the superintendent (Medium Number 2 and he joined this yoga on 8-5-1910 M.L.635,740). During those days superintendent’s permission was necessary to see the Master. Without the permission of superintendent no one was allowed to see the Master. But Sastry garu was exempted because in his test report it is mentioned that Sastry garu is to be guided under the personal supervision of the Master whenever Sastri used to go to Kumbhakonam he used to discuss the Master directly. Sri.Sastriji written his autobiography, in Telugu. In that he mentioned about all important conversations he had with MASTER C.V.V. It is published in English version also. The Master gave initiation and instructed him to follow. “Enter in to the hall, lay down. Do Namaskaram and remember in your heart, the sacred initiated letters one time only. Close your eyes and observe what is going on in your body. If the mind is wandering outside, let it be, don’t try to restrict yourself. That will come on it’s own accord. Give a thought to observe as a witness. That is the only thing you have to do and it will not be possible to open, it will be closed for few minutes. Don’t try to open your eyes. Even if you try to open your eyes it will be closed. When the needed action is completed in your body eyes will be opened. It is not possible to lay down with closed eyes and it is difficult to open your eyes and stand also”. Sri.Sastry got transfered to Tanjore Saraswathi Mahal Library from Madras Government manuscript library. He used to come to Kumbhakonam on holidays to discuss with Master CVV. “When the cart is running, cart should not be repaired. If cart is dismantled for repair, the cart drivers livelihood will be hindered. My yoga is like that. It is not a ABDICTIVE way. It is a Raja Yoga. You must live with family life. You should not become Monk. You should live happily. Daily you should take full meals etc.,. You are thinking to be here with me. I am always in you. I will do the help whatever you want. How you are experiencing the movement in your body, in the same manner whenever you go it will be known to you the working in your body. Morning prayer will show its actions up to evening. How much action is to be given to your body, it gives that much action only, whenever you want. In your body workings are coming through divine force, But not INANIMATE force. It won’t work like electricity. If you use electricity beyond your limits and without regulation it will harm you. If you want to use the newly injected force beyond your capacity it won’t work. How much your body bears it will do to your body. Only that much work will be done”. If you happened to be in travel on rail or in any vehicle or in walk or in any other occasion at exact time you must remember “a second” in your heart (you should not sit and pray). You should not sit for prayer with empty stomach. After taking anything then only you should practice. If any doubt arises without ascertaining the answers don’t ask and write to me. You must write yourself for answers. If you don’t get the answer at any cost then only ask me. Reasonable and proper doubts have arised for that according to their greatness of the questions if they try the answer will be known to them. IF it is known through books, it may be known through close friends. If related inner activity. The yoga was started to know through the inner observation. You must remember with discrimination, truth and righteous then see your inner and help deep inner you will get instructions what you require little by little how you are getting from where? I have no further time to talk with reverent worshipful Master. 1. Directly initiated by Master C.V.V. 2. Directly talking with Master C.V.V. 3. Whenever Sastriji wants to See Master C.V.V., he can directly go inside and see Master C.V.V. without the permission of the superintendent. 4. Master asked Sri Sastriji to come every Sunday from Tanjoor to Kumbakonam. 5. Master instructed Sastriji to sleep along with his wife where Master daily sleeping in the room on that bench. 6. Master gave such ambrosia wordings to Sastriji. He gave those ambrosia wordings to us to enjoy happy life.